The company’s extreme flexibility and potential is fully expressed in the SPED department, created to make special machines designed to meet customers’ specific handling needs. Starting from 39,000 lbs. forklift trucks that can sustain a speed of 9.32 mph to special machines to handle radioactive waste, Carer can offer endless opportunities thanks to its SPED department. If the standard range of Carer’s forklift trucks is the result and synthesis of years of experience in the field with customers and their specific needs, Carer’s SPED department is an open window to the future. The chance to study special handling solutions that can meet even the most complex and demanding needs in close collaboration with customers is what often makes the difference between choosing Carer and adapting to the standard solutions offered by the forklift truck market. 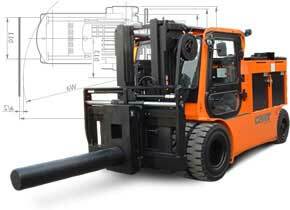 In the field of special machines, customers themselves design the ideal forklift truck for their needs. Our SPED department is just the instrument Carer offers its customers to turn their ideas into reality. Knowing that there is almost always a solution to a specific handling problem, at Carer we encourage customers to discuss any opportunities or strategies they have in mind to design new ways of handling loads together, if the standard range is not a suitable fit.